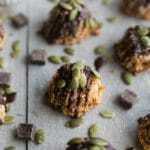 Healthier Pumpkin Spice Coconut Macaroons! This week’s good-for-you treat! So a week from today is Halloween! I can’t believe October went by so quickly! But I’m totally looking forward to Halloween. It’s a “holiday” my husband and I enjoy celebrating! And the enjoyment is totally about the food. Our tradition is to order pizza, hand out/eat treats and watch a movie. (We’re not into scary movies though. I can’t handle those. Ghostbusters is definitely more my style!) What are your Halloween traditions? Does it involve a lot of food and scary movies? 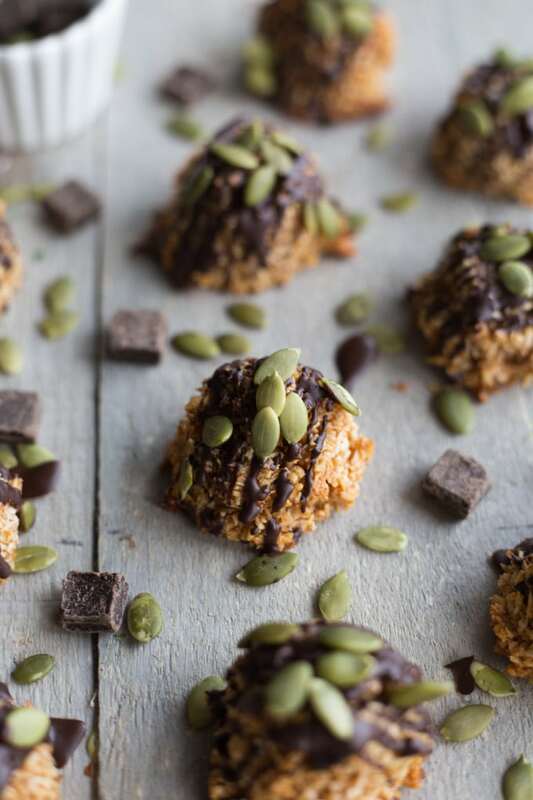 While I’m not sharing a Halloween-themed treat recipe today, these Healthier Pumpkin Spice Coconut Macaroons are pretty close. By close, I mean they’re Fall-ish with lots of pumpkin ingredients – pumpkin purée, pumpkin spice and pumpkin seeds. But don’t get me wrong….the coconut is still the star of these macaroons! I’m a huge fan of coconut, so it was only a matter of time before I posted a macaroon recipe to the blog. I’ve always loved homemade macaroons, especially at Christmastime. And they are one of the easiest cookies to make. The recipe I use just involves combining coconut, sweetened condensed milk and vanilla, scooping spoonfuls onto a baking sheet, topping with a cherry and baking for 10-15 minutes. Done! I eliminated the condensed milk, and added honey and almond butter. This is the glue that keeps the macaroons together. I used unsweetened coconut, because sweetened is overrated, and at the end of the day, us coconut lovers just want plain old coconut. For taste, I threw in some vanilla, pumpkin spice and salt. You might not think the little bit of salt is necessary, but it totally adds to the taste of these macaroons! Also for taste, I added 2 tablespoons of pumpkin purée. I know what you’re thinking. Is it really worth opening a can of pumpkin for just 2 tablespoons? It totally is! Besides, you can use the leftovers to make these pumpkin pecan protein donuts 😉 ! And, of course, I added dark chocolate drizzle to the top, along with a sprinkle of raw pumpkins seeds, because that’s just how I roll. The dark chocolate is a bit of a decadent touch. But if you know my recipes, you know I tend to add dark chocolate to a lot of my desserts. It adds a rich taste without being overly sweet and it’s usually optional in many of my recipes. 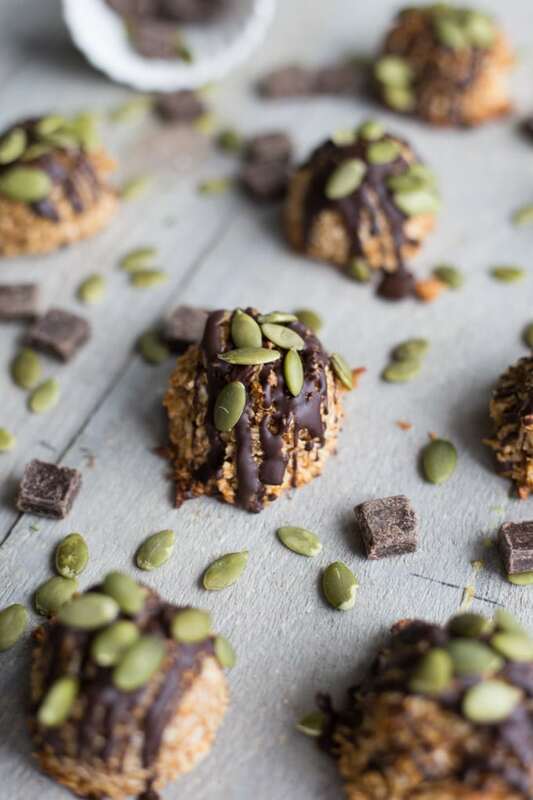 So if you like your clean eating treats with a bit of decadence, make these Healthier Pumpkin Spice Coconut Macaroons with the chocolate drizzle. If not, go ahead and enjoy them without the chocolate. They will still taste delicious. But if you forego the chocolate drizzle, it might be difficult for the pumpkin seeds to stick to the top of the macaroons. And the pumpkins seeds are a must! They add a little crunchiness, which is a nice contrast to the soft and chewy texture of the macaroons! So maybe you shouldn’t skip the chocolate! Just sayin’ 😉 . I’m planning to bring these macaroons along to my Halloween gathering this weekend. But they’re also on my Christmas baking list. They’re quick, easy and crowd pleasing. You just can’t beat that! 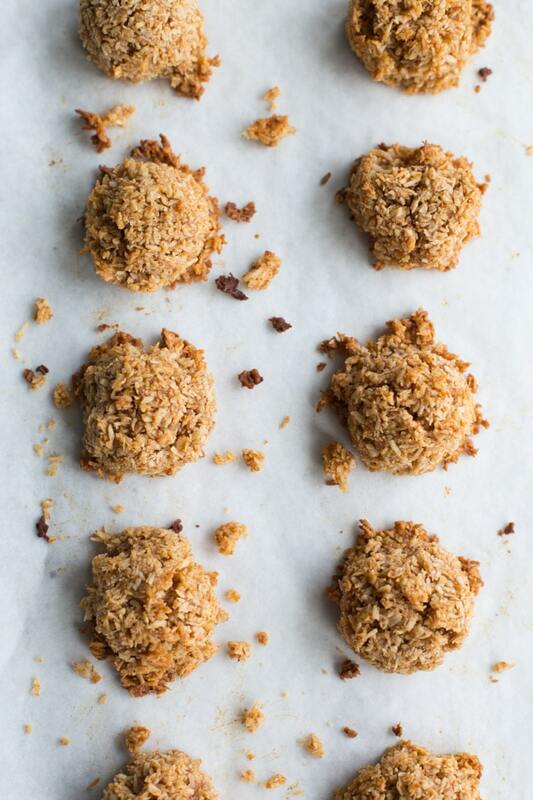 If you make these Healthier Pumpkin Spice Coconut Macaroons, share a photo on Instagram by tagging @crumbtopbaking, or let me know your thoughts below! Happy baking! 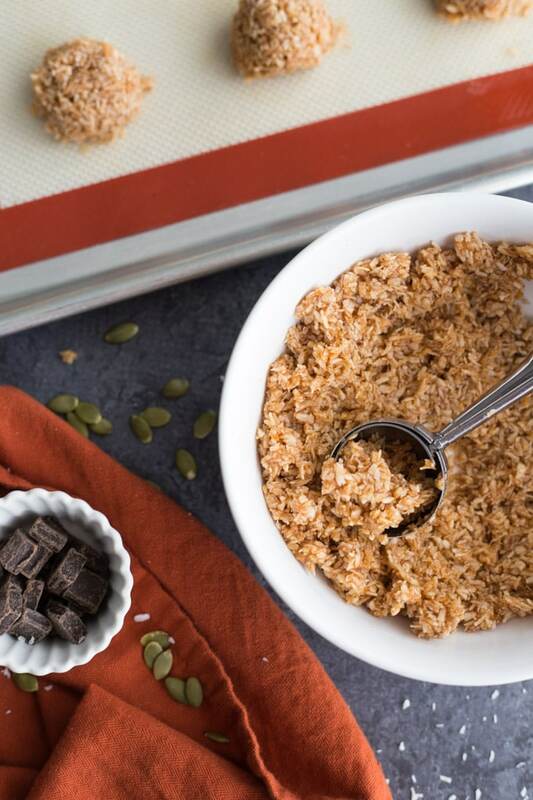 These Healthier Pumpkin Spice Coconut Macaroons use simple ingredients like coconut, honey, pumpkin purée, almond butter, pumpkin spice, vanilla and salt. Ready in 20 minutes, these macaroons are quick, easy and clean eating! In a medium-sized bowl, stir together the coconut, pumpkin spice and salt. In a small bowl, add the honey, pumpkin purée, almond butter and vanilla. Stir until well combined. Add the wet mixture to the dry mixture, and stir until the coconut mixture is well coated. Use a 1-tablespoon cookie scoop to scoop the macaroon mixture onto the prepared baking sheet. The macaroons will not spread, so you only need to leave an inch of space around each one. You should get about 10 macaroons. Bake for 12-14 minutes, or until the macaroons are browned on the edges. Remove the macaroons from the oven. They will still be a bit soft, but they will firm up as they cool. I usually let them cool completely on the pan. Once cooled, add the dark chocolate and coconut oil to a small bowl and microwave for 30 seconds. Stir and microwave for another 15 seconds. Stir until smooth. 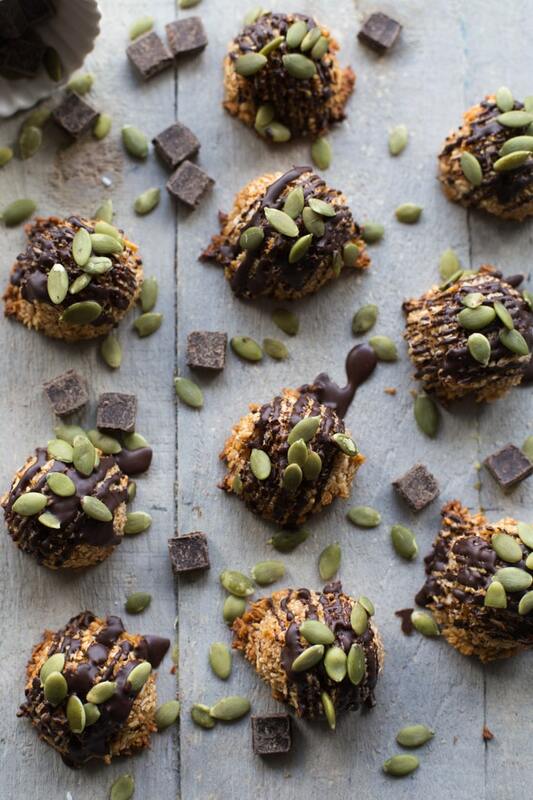 Drizzle the chocolate over the macaroons and sprinkle on the pumpkin seeds. Place in the freezer for 15 minutes, or until the chocolate has set. Store the macaroons in an airtight container in the fridge and enjoy within 4-5 days. Or freeze for later enjoyment! Thanks Kelsie! You should totally make 2 batches! I made 3 batches the other day and I have none left. I hope you (and your mom!) like them! Thanks Dawn! Sliders sound like a fun tradition too! And so does dressing up your fur baby! I imagine you have some pretty cute pics of that! Coconut is definitely one of my top 3 baking ingredients. I love the texture and taste it brings to cookies, muffins and cakes. And I tend to sprinkle it on everything. Hello coconut topped pancakes and smoothie bowls! I’m always up for a healthier option of anything Leanne! And these look delicious too! Thanks Mary Ann! 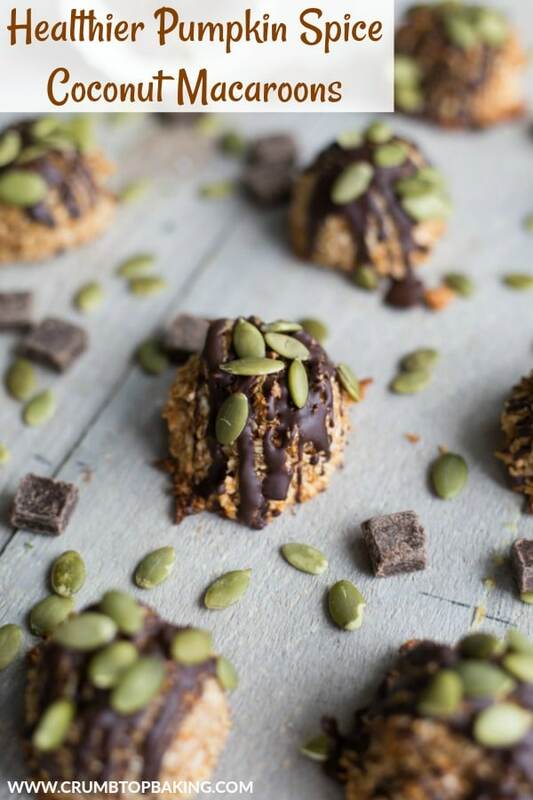 I love turning some of my fave cookie recipes into healthier options! i’m so not a scary movie watcher either! They make it hard for me to sleep!! We also love getting take-out on Halloween though! I love that these are healthier! So good!! Thanks Katherine! I always like having a few healthier options around on Halloween. I’ll definitely be making another batch of these for the 31st! !